Our easy to use CMS will allow your staff assist your customers with ease. GPS Plotting will allow you to know exactly where each plot is located. We at Windy Prairie System value the friendship with our clients above all else. Our systems are initially developed by our developers but the overall user experience comes from our clients and users. 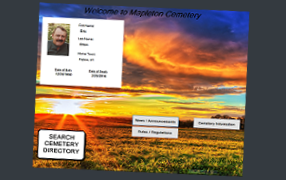 We started in 2000 to provide innovative directory products for cemeteries and memorial parks. Our products are designed to allow local communities to build a lasting, permanent memorial for their town. Based in Indianola, Nebraska, Windy Prairie Systems, Inc. has partnered with communities in Nebraska, Kansas, Colorado, Wyoming, Iowa, South Dakota, Oklahoma, and Texas. Our organization is committed to the continual development of new products for the cemetery and memorial marketplace. Computer technology utilized in our TouchScreen Directories and Virtual Memorials provides new opportunities for celebrating the lives of loved ones, and allows for easy access to important genealogical information. Additionally, our Internet cemetery database and Virtual Memorials allow you to share the lives of your loved ones with friends and relatives around the globe. 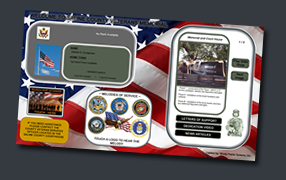 Our Veteran Memorial Software will help you immortalize your veterans for all to see and enjoy. With multiple different models to fit any needs of our customers. We are second to none. Our Basic Mapping service will take the existing map you have and break it apart to allow our systems to drill down to the specific plot or brick. If you don't already have a map, one of our map experts will come assist you in creating a detailed map. Same with if you map needs some TLC, our map experts will be pleased to help you out. Our Cemetery Directories are the best in the business, whether its a stationary or mechanical model or one that has gone "Digital". We take pride in building you the best directory for whatever size cemetery you have. Check out Our Structures to see some of our designs. Our software for the Cemetery Kiosk is second to none and with our IT department always wanting to do more, no other system will catch up. With over 10 years of kiosk experience, we take much pride in knowing that our systems can stand up for the long term. We will continually makes updates to make our systems more resilient and easier to use. Our Cemetery Management System is designed to assist you in your everyday needs of a cemetery. Get fast details about your cemetery and what needs to be done. Easily assign/create burial records and assign them to a plot in your cemetery. Contact one of our sales representatives for a demo of our system. Want to allow the public to search the records of your cemetery, get our Online Hosting Service and anyone in the world will be able to learn about the people you have entombed in your cemetery. There is a yearly fee for our Online Hosting fees, but it is less than you think. Our Veteran Memorial Software will help you immortalize your veterans for all to see and enjoy. - When did they serve - What honors did they receive - Which wars were they apart of Let you community know how each veteran help serve their country with a short bio of the veteran.